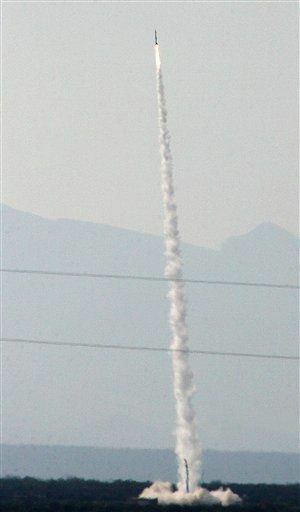 A Spaceloft SL-2 rocket is launched Saturday, April, 28, 2007, from Spaceport America carrying the ashes of about 200 people whose family members were on hand to witness the launch. The launch was the spaceport's first successful mission. The general public may soon have the chance to rest in peaceon the moon, at least briefly. Houston-based Celestis, Inc. has announcedplans to launch cremated human remains to the surface of the moon as soon as2009. A small portion ? 1 gram ? of theencapsulated cremated remainsof one person can be sentto the moon for $9,995. The price includes the option of watchingthe launch, an inscription of the deceased's name on an accompanying plaque,and complimentary scattering of the remainder of the remains at sea near thelaunch site. For $29,985, Celestis will launch 14 grams total of thecremated remains of two people together. These prices do not include cremation, which can generallycost about $2,000, said Doug Sholette, funeral director of the FraryFuneral Home in Ogdensburg, N.Y. For comparison, coffin burials on Earth usuallycost at least $5,000, Sholette said. One gram of cremated remains is less than 1 percent of theaverage person?s remains, which usuallyweigh 3 to 5 pounds, Sholette said. When Celestis sends a person's ashes to the moon, they stay within a capsule in a spacecraft on the lunar surface forever,and are not dispersed. "We are pleased to schedule theseLuna Service missions, to extend our leadership in the commercial spaceindustry, and ? most importantly ? to serve our global community of familiesand loved ones wishing to honor the life of a special person," said Charles M.Chafer, Celestis founder and president. Celestis has partnered with Odyssey MoonLimited and Astrobotic Technology, Inc., which will do the actual transportingof the remains to the moon. Future customers won't be the first peopleto have their remains spread on the moon. In 1998, Celestis, at the request ofNASA, provided a Luna Flight Capsule to the family and friends of the latelegendary astronomer and planetary geologist Eugene Shoemaker. The CelestisFlight Capsule, containing a symbolic portion of Shoemaker?s cremated remains,was attached to NASA?s Lunar Prospector spacecraftand launched on a one-year mission orbiting the moon. On July 31, 1999, at the completion of Lunar Prospector's mission, the spacecraft was intentionally crashed into themoon's south pole, making Shoemaker the first human to be laid to rest onanother celestial body. NASA called the memorial "a special honor for a specialhuman being." Since 1997, Celestis has been sendinghuman remains into Earth orbit. The company conducted six memorial spaceflightsfor people from 14 nations, including "Star Trek" creator Gene Roddenberry, Mercury astronaut Gordon Cooper and"StarTrek" actor JamesDoohan ("Scotty"). The next Celestis mission, set for June 2008,will send the remains of 205 participants to Earth orbit aboard a Falcon 1rocket.